Protect your horse with the Tough1 Tough Timber Snuggit Turnout Blanket, with all the features you want and need in a sheet. It's made of 1200 Denier waterproof ripstop poly outer shell with 210 lining, 250 grams of polyfill, and an adjustable Snuggit neck that allows you to customize the fit to your horse. Machine wash with cold water, gentle cycle with mild detergent. Air dry or machine dry/no heat. All my horses wear this blanket. Love all the adjustments to make them fit perfect. It held up all winter no holes & I have a 2 yr old who is always getting in trouble. She never sweated under it, would definitely recommend it. I love this blanket, and I think my horse Rey will too! Fits great, tons of useful details, well made, and it looks great! I loved this blanket for my small, narrow-chested Arab. I was able to draw the chest/neck area snug to fit her when other blankets didn't. I would recommend reinforcing the material where the leg straps attach. I have been very pleased with my Tough 1 blankets. They stay in place very well. I have 2 horses turned out together 24 hrs. a day and the blankets have endured their antics well and kept my babies warm. The snuggit neck is a great idea! My horse has been tuff to fit. He is short though his back but wide. The extra adjustments help to stop rubbing off his fur. I really like this brand! This blanket is wonderful...light weight but warm and I love the snug fit at the neck. Great blanket and you cannot bet the price. Blanket fit great. Clip broke 3rd day. Overall I like the blanket, but the front clip broke the 3rd day he wore it. It was easy to replace, but felt it should have lasted a lot longer. Wish there were more colors -other than orange or pink.Otherwise fits nicely, strong and warm. It seems to be a very nice blanket. It fits well and is easy to put on. However, the true test of a blanket is how well it holds up and it's too early to tell about that. Also, the sizing is small. My horse needed to wear a size larger than she usually wears. This blanket is so adjustable that I was able to make it fit my horse altho it was slightly too big. I ordered the wrong size but it fit great anyways because you can easily adjust it in several places. Quality is very good. Material seems very durable, and the print hides dirt well. Sizing seems to run small. I bought an 81” as that’s the size my horse’s previous blanket is, but the new blanket is way more snug. Would definitely recommend going up a size if you buy. Although the weather has been mild here in Wisconsin should keep my mare toasty warm and dry. I purchased this blanket for a naughty boy that likes to tear his blankets on fences, trees,etc. Not only does this blanket fit perfectly and look great, but he hasn't ripped it!!!!! Love this blanket! A wonderful winter turnout for my horse who lives on 20 acres of brushy pasture (with run-in). Extremely adjustable to fit many body shapes, he can run and roll in comfort also! The bright orange makes him easy to spot when doing chores in the dark also. Great blanket! Fits well and true to size. LOVE the snugit adjustment on the shoulders!! My horses all have one and were grateful during our first snow. Super easy to put on and take off. As our herd grows, so does my inventory of these blankets. I've tried others, but I always come back to these. They last! Purchased two for a gelding and colt. The fit is perfect for both. We got them just ahead of this winter storm and they stayed dry and comfy in a lot of snow and freezing rain. Can't beat them for the price and quality. I have already wrote one review when the blanket arrived, but updating again to say I absolutely LOVE this blanket!! I bought it for my growing warmblood/paint filly and she fit a 72" I order a 75" and have all the adjustable pieces as small as they go for her and it fits her great so happy that is will "grow" with her!!! Most importantly it keeps her warm she is very sensitive to the cold northern Michigan weather!! I will be purchasing more for the others and especially purchasing another once she grows out of the 75"
Love theses blankets they are great quality! And has handled my young horses trying to tear them off ! Great blanket for my older waemblood. I love Tough 1 blankets. I've had other name brands blanket that claim to be water proof but they weren't. When it's raining and cold, my horses are dry and warm! I highly recommend Tough 1 blankets. Awesome blanket, I bought the orange one over the summer. They run small, my mare wears a 78",,,, in the blanket she'd need a 81 at least. Purchasing a new one in the larger size. Great price for a great blanket. Pleasently surprised but the weight and quality!! Wow...for the price, I really honestly didn't expect much from these turnouts, but I'll say now that these turnouts beat the ones I have purchased in the past by the "Big Name" blanket companies hands down. I've become accustomed to replacing my Weathabeetas, and Rambos every single year, sometimes even half way through winter, and even when they do survive winter, they are always shredded beyond repair by spring...I cater to a pretty tough crowd I guess. The weight of the shell on the Tough-1s is much heavier feeling than any I have had in the past, and I have high hopes that they will survive better for about 1/2 the cost. I have bought many turnouts over the years, and I can feel the difference in quality...and the detail work is well done too. I'll know more come June, but for now I'd recommend these turnouts highly. Perfect fit. Keeps her dry, and it looks good on her. I like the look of the 2 blankets I purchased for my geldings. Very different! The description is medium heavyweight yet they appear warm and light. Really well seen. I am putting them on tonight for the first time. Rain and snow in the forecast. More later...after it snows! I didn't know what to expect for the price. It was a fantastic price. This blanket is so nice with so many adjustments and really rugged construction. I love the color as well as it hides dirt and manure stains. I highly recommend this blanket and will buy it again when the time comes. Great blanket at a great price! Fantastic and fits my yearling great! Everyone needs these if you have horses in bad weather. I loved this for my horses. They were easy to put on and take off. The clips are the best part. Highly recommend. We get light to moderate wet snow, and it does it’s job. I have purchased this blankets for all my horses and will always buy this particular brand. I have horses with shelter and some with none, they stay completely dry. It withstands the beating of pasture horses . I would highly recommend this blanket. I am very happy with the blanket super fits my horse,true in size ,would buy them anytime again ! this blanket was a great buy, more coverage and better fit than i've ever had. bought 69" for 13.2 hhish squarely built grade pony. I love the Snuggit Tough Blankets. I was afraid to buy because I didn't know if they would hold up to the wear and tear of my gelding. He tried to rip off the one on my mare and he didn't even put a hole in it! I purchased two last year and have had no issues to date. Thanks for a great product. So happy we bought this for our pony. We are having a very cold winter and this blanket is perfect! Great blanket. My 30 year old Arabian loves his jacket! He has worn it during the winter for the last three years. I have had to replace 1 snap this year when he hung it on the fence. The snugg-it feature also allows me to custom fit this blanket. No gaps around his neck. Fits great and keeps him warm and dry. Easy to put on, fits very well on our leopard appaloosa. Covers his tail well, and he likes it. What's better than that? Ordered one a couple of years ago and it has served us well. However my mare has been hard on it so it is being put on reserve use. These blankets are very easy to put onto a fussy horse and because I live in a hunting area I like the 'don't shoot me orange'. We love our other blanket like this and it's a great value! These blankets are a little large but the quality and style certainly overcomes that. Own another one that is identical purchased last year and it's holding up beautifully. Bought a second one in case its a wet winter this year as a back up. Snuggit blankets are great and this is the best price I've found! I Like the Tough 1 Brand and the price and value make it an excellent choice. Have purchased this brand of blanket before and like them best. Very durable and fit well. Easy to wash. This item was recommended to me by a horse owner/trainer. The price is amazing. I have bought these blankets before. They fit well, and hold up extremely well. Great product for a great price. I have a Tough 1 blanket and love it. This is a lighter weight one for milder weather. The weather decided to be stupid and cold. I like the adjustable neck on this blanket that makes it fit better. Need a warmer blanket, and rating was great. Good quality blanket for the price. Ships in a week. Really like these blankets. They hold up well. The price is very reasonable and I have had some of these blankets before and they were very serviceable. Good quality and fit. Very water resistant. I got one for my elderly mare a couple years ago and it's held up very well. Bought several of these blankets a few years ago and love them, getting more for additional ponies and cobs. more horses this year, more blankets needed - these really hold up well! It's already November, I waited to long to order. It's the only one in the size, weight and price that I could choose. I would have preferred a solid color but don't think my mare will mind. Looking for a good quality, warm, and adjustable blanket for my growing warmblood/paint filly. Chose this for my boys who are not stalled for the winter. I will write a review once it comes in! The pricing as well as review comments sold me on this blanket! I love the 1200D blankets. they hold up, tear less. I need a heavy weight turnout blanket for one of my horses. I liked the print. Can I order a different color to get it faster? BEST ANSWER: Andres, that's what I did. The color I wanted was out of stock, so I ordered the orange/camo and I'm really glad I did. It's a beautiful blanket, warm and fits well. When I took my horse to an event and she came off the trailer in her new blanket, she got all kinds of attention. Everybody loved the color and several asked me where they could get one like it. yes, just change your color selection until you see the green circle with a white check in it. That means the selected merchandise is in stock. No. I need the Orange! I already have the Orange from a previous order. But thank you very much. Really does not apply to my situation. I paid extra to get in 2 days. Right now we have the size 84 in stock available in pink. I got mine fast. And right before my mare needed it. Sorry I misspelled your name, Andrea! I just rescued a horse and he is very emaciated, not sure how to compensate for his filling out? BEST ANSWER: I'm sorry; not sure how to answer that! I haven't seen your horse and would not be able to see how much weight he needs to gain. I would just fit him properly now for the season, and you may have to sell it after this year, and get him a new one next season! And, thank you for your rescue!!!!! Happy Holidays!!! I would definitely get a size that fits him properly now so it keeps him warm so he can gain weight. There is adjustment in the front and the sides are longer than most blankets so it will be able to grow with him some as he gains weight. Hope this helps. Thanks. This is our 2nd winter and very pleased so far. I have 2 of them. One is for a mature filled out mare. The other is for a younger growing mare, and I was able to adjust it this winter to accommodate her growth/filling out over the past year. BEST ANSWER: I was told by my daughter, who knows more about this than I do, that this blanket is good for very cold-snowy weather. This blanket works best for horses that r out in the weather, not stalls. You want the denier to be 1200 or higher and 3 grams or more. Just for added warmth on subzero temps, put a fleece blanket underneath for added protection. I am responsible for blanketing 42 horses for all different reasons. This blanket worked well for southern winters on a horse with a medium type full winter coat. If she was body clipped I may have gone with a blanket with more poly fill or up on the neck more and a liner. Hope this helps. These blankets are best for 30 degrees to single digits. Not sure yet how warm it will be for subzero weather. But we have had single digits already and my mare is doing great in the blanket so far. For the money these blankets are super nice. I chose this for my 29 year old Appy mare here in Maine. She goes out in the winter for short periods of time. I wanted warmth with strong outer lining. I also love the neck adjustment. This is honestly one of the best blankets I have bought. For any weather, or temp. Fits the horse perfectly and there is no rubbing at all. Honestly, this blanket is perfect! This blanket is a medium weight blanket. We had a cold spurt and I put it on Tucker; it was perfect. You will be happy with this turnout blanket. This is a heavyweight blanket, good from 15 to 30 degrees. If it's warmer I'd go with a midweight, if colder add a liner or go with a 300 gram fill blanket. I love this blanket. I use it when the nights are below freezing and the days are in the 40's. I leave my horse un-blanketed if it is warmer. We bought this blanket for the cold weather and it gets down to the teens at night and it works great. I'm sorry but I can't be of help. This jacket is backordered and I haven't received it yet. What if it does not fit? What is the return policy? BEST ANSWER: If you are not completely satisfied with an item, you may return it within 30 days from date received. * The item must be in its original condition and box; including all parts, accessories and packaging. Call us at 1.888.809.0751 to obtain a Return Authorization Number (RA#) and shipping instructions. Include a copy of the original invoice with your return and write your RA# visibly on the outside of the shipping package and on the packing slip. Please tell us why you are returning our product, so that we can continue to improve our service. Is this a heavywinter blanket or a sheet ? This is a heavy winter blanket that has been battle tested with our current winter weather here in New Jersey. It is a heavy blanket ..
is pink pink and camo or just pink? Is there a picture? BEST ANSWER: It's pink on top with camo around the neck and along the bottom. Mine is camouflage on top and solid brown on the bottom. I think you can get them with the solid color on top with camo on the bottom. Shelby has so many new blankets. This particular one has not been worn yet. I have a 2 year old that measured at 68. I want to get it big enough for her to wear into adulthood...hopefully, as she's my smallest horse and I don't want to buy a blanket that will be sitting around after 1 year. Should I get the next size up? BEST ANSWER: I ordered a size 72 for my 3yo QH. She'll be 7 this year and the 72 is a little snug, but still fits. A 75 would probably fit her better, though. Of course all horses grow differently, but from now on I will probably order a size up if buying for something under 4yo. I see this question is pretty old, but hopefully my experience might help others, too! Measuring Instructions - Stand your horse as square as possible, measure from the center of chest around side of the body to the point of the horse's rump just before the tail. If you horse ends up measuring between sizes always round up to the next size to ensure full coverage. I've already measured her and know that she's a 68. My question is "should I buy the next size bigger so that she can grow into it?" and then I won't have a newer blanket just laying around because it doesn't fit any of my other horses. I know that horses grow until around 5-6. At this point, being 2.5 years old, I'm not quite sure as to how much longer she is really going to grow. Does this have velcro in front in addition to the buckle straps & clips? BEST ANSWER: Yes, it has Velcro in the front. I have tried many blanket and this brand works best for my horse. He is shaped like a halflinger 15.2 hh and 1500lb. Yes,it does have velcro. I have been very pleased with both my Tough 1 blankets and intend to buy more. I'm sorry for the delay in answering. Yes, there is velcro in front along with sturdy clips. This is a really good blanket - tough and durable - for a really good price. Yes it has two strips of very secure velcro. short of the tail, especially for stable wear. stretched to the center of the tail (dock). Measure your horse from the middle of the chest around to the end of the hindquarters before you get the tail. If you come up with an in-between number, round up to the next biggest size. You can look up how to measure your horse, i believe it is from chest to start of tail that you should measure and depending on how many inches that is, is how big your blanket must be!! Measure from the center of the chest to the center of the tail, and add two ( at least that's how I did it and mine fit perfectly). Measure from the center of the chest to the edge of the tail. If between sizes go up to the next size. BEST ANSWER: Yes! My little mare just wore it in the rain and was completely dry the next morning. I live in CA so we dont get weeks of rain but it does great in off and on rain showers. yes holds out pretty well in rain or sleet. Yes, my horses never got wet. BEST ANSWER: refers to amount of fill, so 200 grams of fiber fill. I use for my medium pony when it goes into the 20's and teens.. . rarely gets into single digits here in VA. If you mean 1200 denier that is the thickness of the blanket so if it gets in the 20s or lower the blanket will help keep your horse protected but if it is in the single digits and the wind is blowing i would put my horse in the barn. That is the fill in the blanket some are more like 300g or 400g that is a really heavy blanket. 200g is a medium weight blanket. 200 g is the fill which determines the weight or level of warmth. This would be a medium weight blanket. Are there D rings around the neck opening for attaching a neck cover? BEST ANSWER: Yes you can attach a neck cover to the d rings. is this blanket water proof or water resistant??? BEST ANSWER: This blanket features a 1200 Denier waterproof rip-stop poly outer shell, but please keep in mind turnout sheet and blanket materials are waterproof and designed to keep your horse dry, however if your horse is turned out in a field without a run in shed or shelter during prolonged rain or heavy downpours your horse may still get wet especially in the neck and tail areas. Yes, it is water proof. is it water proof or water resistent iam looking for something he can b in the rain with and not get wet? BEST ANSWER: This blanket does have a 1200 Denier waterproof rip-stop poly outer shell but please keep in mind, turnout sheet and blanket materials are waterproof and designed to keep your horse dry, however if your horse is turned out in a field without a run in shed or shelter during prolonged rain or heavy downpours your horse may still get wet especially in the neck and tail areas. Has been waterproof for me. At the end of last season I washed it in a blanket wash and a blanket rinse I purchased from Stateline. It is still waterproof this year. BEST ANSWER: Yes. Works well in light to moderate snow. Just have to dry it out if it gets wet. That's mainly what I used mine for. They are great and easy to put on. what size would you recommend for a weaniling? BEST ANSWER: Measuring Instructions - Stand your horse as square as possible, measure from the center of chest around side of the body to the point of the horse's rump just before the tail. If the horse ends up measuring between sizes always round up to the next size to ensure full coverage. It is a nice heavy coat. Measure for size so it can be snugged up. It is true to size. The Snuggit blanket 72 fits everywhere except the belly straps seem too loose. I have adjusted them but it seems still loose. I am able to get more than one hand in there. Unsure what to do. Don't think going to a 69 the bell straps will be any smaller. Any suggestions/recommendations? BEST ANSWER: How loose are the straps? You say you can fit more than one hand but how much more than one hand? You really don't want the straps to be much looser than they would be with a fist in between the straps and the horse. If your straps are looser than this the easiest way to shorten them up is to tie a knot or two in the straps to shorten them. You could take the blanket to a seamstress with a heavy sewing machine if you want them professionally shortened but I personally have tied knots in blanket straps in the past and have had no trouble. I hope this helps. I loved it.except I had same problem.with the straps getti,g to stretched out. Ouldnt get them right enough. BEST ANSWER: I got my blanket with in the week. Didn't take long at all. The support people are very helpful. Estimated In Stock by 02/03/2015, I'd suggest setting a reminder for the item. Is there a neck cover available for this blanket? BEST ANSWER: Yes, search under tough 1 neck cover. there are a few different grams and designs. BEST ANSWER: It is 250, and I love my blankets! I own 3 and this is the 3rd year using them. What model number is this blanket? BEST ANSWER: Size 84 in black is Tough-1's model number 32-712025SC-2-84. I want three but I want different colors and sizes. But I can't get it to do this, only three the same how do I do this? BEST ANSWER: You would need to go back to the item's page each time & select each color and size to add them individually to the shopping cart. You are also welcome to call our Customer Care team for assistance. We are available 8AM-8PM weekdays, Eastern time at 888-809-0751. 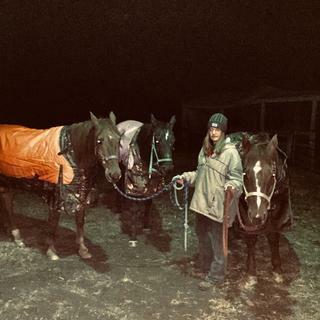 In the photo with horses, the black blanket has black surcingles and straps. In the product photo, the surcingles and straps are brown. So - are they black or brown? Sounds trivial, but all my other Tough-1 blankets are black and I'd rather they all be the same in case I need to order replacement straps. Thanks. BEST ANSWER: Typically the straps will be brown; however, the manufacturer will sometimes substitute black. Color may vary. How many grams of fill is this blanket? how do i know the size of the blanket I need for a medium size horse. she is 4yrs old. apalooza? Is this a mid-weight blanket? BEST ANSWER: 250 grams Poly Fill would be considered a medium weight blanket. How to measure for horse blankets?